At FIXLINK we take an annual boiler service very seriously and we believe that the gas boiler service shouldn’t be confused with gas safety check! We have a holistic approach to annual boiler service-Just like your car needs to have a service to make sure the brakes are safe and to change the oil, a boiler needs to be serviced by Gas safe registered engineer, to make sure it is running safely and efficiently. 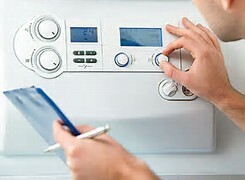 It’s also a requirement of your Boiler Warranty to have an annual service.